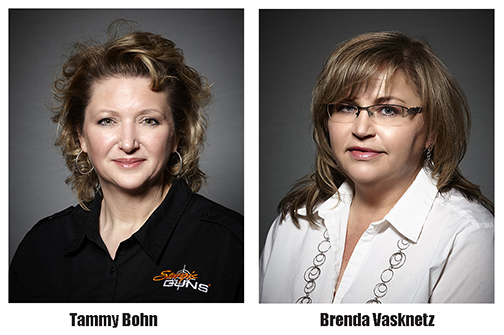 Experienced motorcycle rally event specialists Brenda Vasknetz and Tammy Bohn are now part of the Sturgis Buffalo Chip team. Brenda Vasknetz will serve as the Buffalo Chip’s Brand Alliance Manager, working closely with Sponsorship Director Lon Nordbye. Vasknetz, formerly the Sturgis Rally & Events Director, served the City of Sturgis for the past 27 years. The Sturgis Buffalo Chip also recently welcomed motorsports, firearms and sponsorship expert Tammy Bohn. Bohn will be under contract to assist the Buffalo Chip’s sponsorship team, working to develop strategic partnerships and promote the Chip’s numerous assets to motorsports and related industries. “We are thrilled to have both Brenda and Tammy on our team. They bring a great deal of expertise in the rally, motorsports and firearms industries and will be assisting us with exciting new developments,” said Rod Woodruff, Buffalo Chip president. Vasknetz’s extensive strategic development, organizational and financial operations experience is an asset to her new position. “I’m looking forward to working with the Buffalo Chip team and being part of its planned expansion and new developments,” said Vasknetz. “This is an exciting time at the Chip, and this position will allow me to continue working with many organizations and businesses with which I have built relationships in order to help them experience an even more successful event.” Bohn has worked in the motorcycle, motorsports, and sponsorship industry for more than 17 years, most recently with the City of Sturgis. She and her husband, Justin, continue to own and operate Sturgis Guns in Sturgis, SD.